The world is in mourning after the horrific murders of nine innocent people in Charleston, South Carolina. 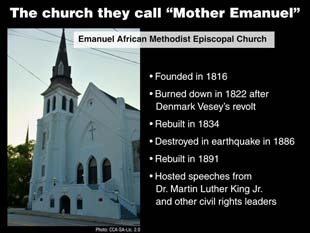 On June 17th, a 21-year-old white supremacist shot and killed nine African Americans at Charleston’s historic Emanuel African Methodist Episcopal Church. 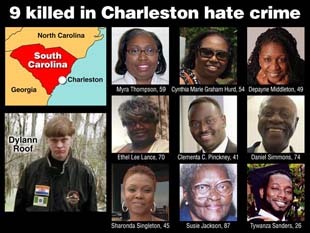 The victims ranged in age from 27 to 87, and included Reverend Clementa Pinckney, a member of the South Carolina State Senate. Six of the nine victims were women. The gunman, Dylann Roof, apparently walked into Emanuel’s weekly Wednesday night prayer group and asked to sit next to Rev. Pinckney. According to survivors, he sat with the group for nearly an hour. Then he took out his gun, made racist statements, and started shooting. One report says the shooter made sure one person was left alive to tell the story. After the shooting, Roof managed to get out of South Carolina, but he was later arrested in North Carolina. He told police he almost didn’t go ahead with the shooting because the people had been so kind to him. Citizen journalists found Roof’s webpage, which is full of racist statements, including a statement that he wanted to start another civil war. There were also pictures of Roof with the Confederate flag, and one showing him burning the American flag. In one picture, he wears a jacket with the flags of Rhodesia and apartheid-era South Africa, two African states that were dominated by whites for many years. Many are trying to understand the dangerous racism underlying this crime. But instead of dividing people, the crime has brought people together in Charleston and across the country. Soon after it was built, Emanuel was thrust into controversy. One of the church’s preachers, Denmark Vesey, was a free man of color who tried to organize a rebellion of enslaved black people. After Vesey and many others were arrested and hanged in 1822, local white supremacists burned the church to the ground as a lesson for anyone else who might try to break free of slavery. Members rebuilt the church in 1834, but they were not allowed to meet there because of laws that banned all-black services. In 1886, after the war was over, an earthquake flattened the church. Members rebuilt the church—for the second time—at its present location in 1891. Others are angry. These people say that this latest crime is a reminder that the U.S. has never gotten over the Civil War. One of the biggest pieces of evidence for this is the Confederate Battle flag, which still flies on the grounds of the South Carolina State House. Protesters have called this flag a symbol of slavery and racial mistreatment, and have demanded that South Carolina take it down. Supporters of the flag say it is part of South Carolina’s history and honors those who from the South who died in the Civil War. 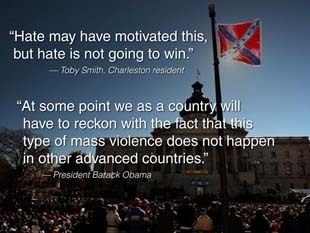 Last week, the governor of South Carolina, Nikki Haley, changed her position and called for the flag to come down. A Republican state senator in South Carolina is introducing a bill to remove it from the statehouse grounds. 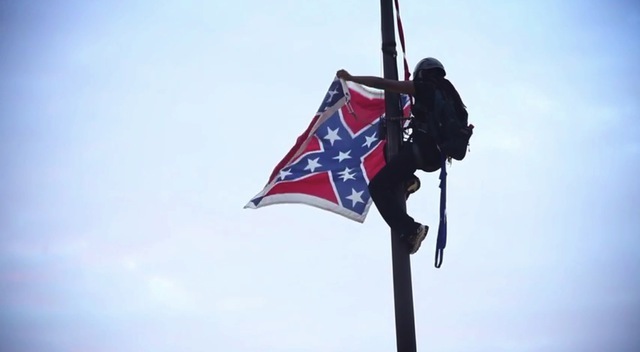 And on Saturday, June 27, a woman named Bree Newsome took matters in her own hands, scaling the flagpole at the South Carolina capitol to take the flag down herself. Meanwhile, of the biggest flag manufacturers in the country said it will stop making Confederate flags. Some major retailers, including Wal-Mart and Amazon, said they will stop selling it. Do you think the Confederate Flag should continue to fly outside of government buildings? What do you think the flag represents? Does this incident indicate the need for stricter gun control? Why or why not? Originally posted on Read to Know, a publication of NewsCurrents/Knowledge Unlimited. Next What Marriage Equality Is–and Isn’t–for the LGBTQ Community by Sasha B.